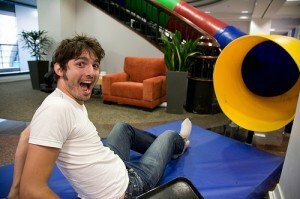 The folks over at laughingsquid.com got the chance to tour Google’s new San Francsico office. I’m loving the slide installed over the stairs of the building. They also have a few pictures on their Flickr page. In addition to the guy with the “Marry Me Leslie” sign there are lots of other Google employees lining the street – very cool.